The IPL Indian Premier League is the world’s most popular cricket tournament and sees every in the world. This depends on where you are from. Ofcourse, a lot of people have mentioned Hotstar. Because they think you will watch from India. But Hotstar isn’t the only way to stream IPL. This year (2019), Jio and Airtel have teamed up with Hotstar to show IPL matches live for free on their respective digital platforms for india only. In the US, Hotstar again has the rights, but Willow TV too can be used to watch the IPL. Hotstar All Sports Pack at Rs 299 for IPL cricket match live streaming Now Hotstar Vip 365 match For 1 year sports connection. Hotstar is the part of the Star network, has the digital streaming rights for IPL cricket matches in India. It is also partnership with Airtel and Jio to allow them to show live feeds of the cricket matches on their networks as well. Hotstar also introduced a new special pack of Rs365 called the “Hotstar vip 365” that allow users to stream all sports matches live. Hotstar. You would need to have a premium account (₹365/year) to view the matches live. Jio TV. It’s a free service, but you need to be a Jio subscriber to watch the match. The Jio Cricket Season Pack will give you 102GB data for Rs 251 for 51 days. IPL cricket matches can be viewed on the JioTV app for free. Jio has also partnered with Hotstar for the access to the IPL cricket matches. Useer can stream live matches for free on the JioTV app and this pack can be used specially for watching cricket on the Jio network. Of course Jio users will be able to watch the IPL live cricket matches on Jio TV app even if they do not get this Rs 251 pack. You can find Star Sports channels in their sports section. Thiscan only be viewed on a PC and you’ll have to add their VPN extension to your browser to use this site. This is hands down the best site to view TV channels available in India. They also have an Android app which is available at some websites. The Airtel has announced a new version of its video streaming app, which is available for Android and iOS platforms. Both Airtel prepaid or postpaid users will get unlimited streaming of all LIVE matches and highlights of the upcoming IPL 2019 via Hotstar. The new version of Airtel TV app is dedicated to cricket section. 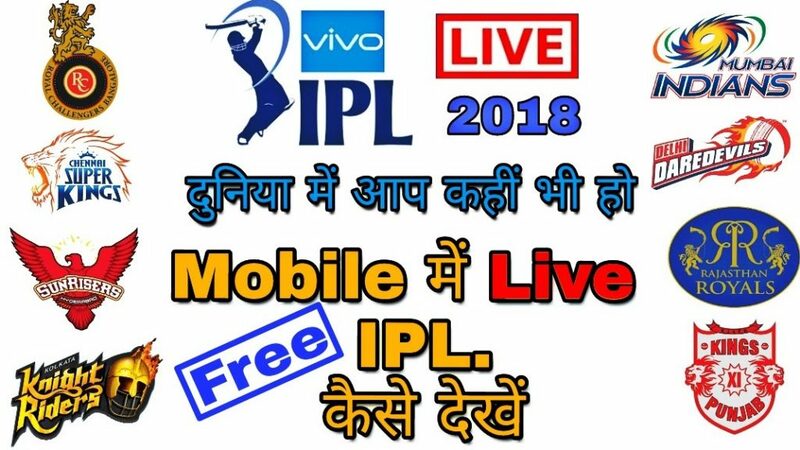 This app allows you to watch IPL live from gulf and other countries like Pakistan Nepal Bangladesh Saudi Dubai UAE USA Kuwait Siria Iraq Phalastin etc. Star Sports to broadcast live coverage of IPL – Indian Premier League 2019 in India and its subcontinent (Sri Lanka, Bangladesh, Bhutan, Maldives, and Nepal) countries; all matches streamed live on Hotstar digital platform (Website, App). Star India has bagged IPL media rights for a massive amount INR 16,347.50 crores for a period of five years (2019-2022), they acquired TV and OTT (Audio, Video, and other media services via the internet) rights. Star India announced that Hotstar now officially available in United Kingdom a all matches streamed online on the digital platform for viewers ipl 2019 IN UK, will be available to subscribers in the two countries via Hotstar with a with subscription fees in two tiers – annually and monthly. Star Gold to broadcast Indian Premier League 2019 in the UK. VIVO IPL 2019 will be available to UK viewers on both Star Gold UK and Hotstar UK exclusively. Star Gold HD which is available on Sky 729 and Virgin 801 for UK viewers. Sky Sports has lost the right to broadcast IPL 2019. Sky Sports has confirmed that it will not broadcast the IPL 2019.
viewers in the United States can watch Indian Premier League (IPL 2019) live coverage on Willow TV, and SuperSport will telecast live coverage of Indian Premier League 2019 (IPL 12) in South Africa; all matches live streamed on the SuperSport digital platform (Website, App). United States Viewers can watch IPL 12 on Willow TV and Sky Sports Cricket to broadcast live coverage in the United Kingdom. BeIN Sports have rights for live coverage of IPL 2019 in the Middle East and North Africa (MENA) Countries. Algeria, Bahrain, Egypt, Iran, Iraq, Israel, Jordan, Kuwait, Lebanon, Libya, Mauritania, Morocco, Oman, Palestine, Qatar, Saudi Arabia, Sudan, Syria, Tunisia, UAE and Yemen. This year’s tournament will be broadcast and streamed live by beIN Sports across 24 countries throughout the MENA region. YuppTV Provider for South Asian content has secured the digital media rights for IPL 2019. YuppTV to live stream entire IPL 2019 in Australia, Malaysia, Singapore, Continental Europe, South America and South East Asia. Fox Sports has rights to the VIVO 2019 Indian Premier Leagu Fox Sports and Fox Cricket available on Foxtel Live Broadcast.